Brodick is the capital of Arran and the point of arrival for most visitors; it enjoys a superb setting on a lovely bay. As well as its intrinsic attractions, Brodick is the starting point for an array of enjoyable circular walks. Towering to the north of Brodick is one of the finest small mountain ranges in Scotland, a spectacular array of jagged granite peaks dominated by the popular objective of Goatfell - much the easiest of the group to climb. Glen Rosa and Glen Sannox penetrate the mountains from the north and south, dividing the Goatfell ridge from the more dramatic but less frequented Corbetts of Beinn Tarsuinn and Caisteal Abhail, whilst the centrepiece of the range is Cir Mhor - a magnificent pyramid of rock. 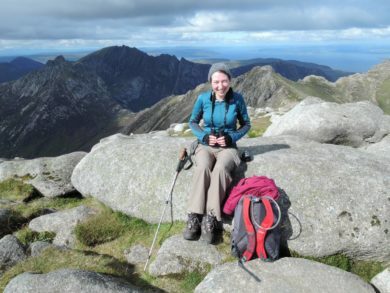 Karen Thorburn writes of her childhood memories and more recent visits to Arran. "With its rugged mountains, lush glens and windswept islands, Scotland is a utopia for nature lovers and outdoor enthusiasts. Despite my background in geography, I have little desire to venture overseas as my constant thirst for landscape photography, coastal walking, island hopping, cycling and camping is quenched within these shores..."